♦ Please read this manual before operating this scanner. of computers and other office equipment. standards and logos are uniform among participating nations. This model doesn’t provide “setting options” for power management. entitled “Digital Apparatus”, ICES-003 of the Industry Canada. “Appareils Numériques”, NMB-003 édictée par l’Industrie Canada. States and may also be trademarks or registered trademarks in other countries. • imageFORMULA is a trademark of CANON ELECTRONICS INC.
Adobe Systems Incorporated in the United States and other countries. • Ranger is a trademark of Silver Bullet technology, Inc. Copyright 2010 by CANON ELECTRONICS INC. All rights reserved. OR LOSSES OR EXPENSES RESULTING FROM THE USE OF THIS MATERIAL. OF THE RESULTING SCANNED IMAGE DATA. Thank you for purchasing the Canon Check Reader CR-135i/CR-190i. file on the supplied Setup Disc and requires Adobe Reader to open. machine safely, always pay attention to these cautions. 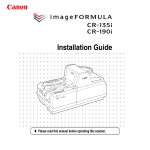 CR-135i/CR-190i, refer to the Instructions (electronic manual). handled on this scanner and scanning operations. error. If this happens, feed the documents one by one. and then scan the copy. it may cause a malfunction. side may be scanned. If this happens, adjust the scanning density. weight up to 111 lb bond (413 g/m2). a feeding error or a paper jam. • Some type of envelope may cause a feeding error or a paper jam. Note the following points when placing documents on the scanner. • Place the front of the document toward you. may cause double feed error. • A maximum of 250 documents can be loaded at one time. cause a paper eject error. This section describes how to load and scan documents. The jogger mechanism can be used to align documents. jogger is operating (CR-190i only) or documents are being fed. the documents with the entry point of feeding. 5.9" (150 mm) in length. Carefully align the edges of the document. the leading edge of the document into the scanner. • The STOP Button is pressed and the scanning stops. Remove the documents from the document tray to close the shutter. Button to stop the jogger. Instruct scanning to start from the software application. Click [Scan Page] from the [File] menu. a Click [Scan Batch to File] from the [File] menu. b Input the File name, and then click [Save]. c Select Simplex or Duplex, and then click [Start Scanning]. a Click [Scan Batch to Printer] from the [File] menu. b Select Simplex or Duplex, and then click [Start Scanning]. • You can also start scanning with pressing the START Button. methods that have been set. 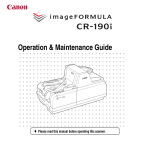 CR-190i, and how to remedy them. fingers, or the document may be damaged. the scanner may cause a paper jam or malfunction. The Scanning Utility is not installed. computer is not compatible with the scanner. authorized Canon dealer for more detailed information. USB cable is not compatible with the scanner. USB hub is not compatible with the scanner. Remove scanned documents from the Eject Pockets. Press and hold the START Button. The jammed document is ejected into the Eject Pocket. following to remove the jammed document. Cover open to the right and left. Cover open to the back. Remove the paper that has jammed. Close the Back Maintenance Cover. A paper jam has occurred. scanner, and if the quality of the paper is appropriate. Scan one sheet at a time in the separation OFF mode. A double feed error often occurs. MICR characters are not recognized correctly. service representative to have the scanner serviced. The ink cartridge may be empty. The scanning glass or rollers are dirty. the Scanning Glass and Rollers” on p. 16. The scan conditions are inappropriate. be sharp or will appear as dark. Check the brightness and other scanner settings. image appears dark, the brightness may be set too low. Also, check the settings on the driver and the software application. The driver or application does not run correctly. Documents get dirty when using the imprinter. Ink from the imprinter has been placed on the feed path. Reinstall the driver or application. on p. 19 in Instructions. compatible. Use the recommended interface card. This chapter describes how to clean and maintain the scanner. outlet. Otherwise, it may cause an electrical shock. contaminate the internal light source and lenses. water or mild detergent. Then, wipe off with a clean, dry cloth. wrung cloth dampened with water or a mild detergent. Use a clean dry cloth to clean the entire scanning glass. There are 26 roller positions, as shown in the diagram below. roller in position a to wipe the rollers. k.Turn the roller in position k to wipe the rollers. • Rollers in positions u to z are turned by the roller in position m.
Turn the roller in position m to wipe the rollers. 10 Carefully replace the Top Cover. to have the scanner serviced. commercially available audio head cleaner. also efficient action when the printed text or bitmap becomes faint. For more information, see “Replacing the Ink Cartridge” on p. 22.
from around the ink jet nozzles. Carefully replace the Top Cover. Cleaning with the Cleaning Cards (U.S.A.
minimize the frequent cleaning as instructed in this manual. Place the cleaning card in the document tray. representative for the available cleaning card. Press the START Button to start cleaning. Please repeat steps 5 and 6. Disconnect the scanner and the computer. Connect the scanner and the computer. • You cannot scan the document without the computer. If the scanner turned ON properly, the power LED continues to flash. Make the following adjustments to maintain scanning quality. scratchy or faint even if you have cleaned the ink jet nozzle. cartridge separately, as shown below. and then turn the scanner back ON. Push down the ink cartridge until it clicks into place. Make sure that the ink cartridge is securely in place. to adjust the print position. Place the ink cartridge shown in the diagram below. applications cannot check the ink level precisely. disposal tank according to the following procedure. • When the ink cartridge is replaced. The replacement ink disposal tank is not included with the scanner. Purchase an ink disposal tank, as shown below. Open the Ink Disposal Tank Pocket. Remove the ink disposal tank. • Be careful not to get dirty with ink. the box of the ink disposal tank. Attach the ink disposal tank. Close the Ink Disposal Tank Pocket. When rollers are worn, paper jams and double feeds tend to occur. Separation Roller) according to the following procedure. exchange roller kit separately, as shown below. Open the Feed Supporter to the left. position, turn the Pickup Roller by hand. the hole on the roller. Push down the roller until it clicks into place. with the hole on the roller. 10 Close the Feed Supporter to the right. 11 Replace the Roller Cover. Slide the Adjustment Dial Cover to the left. 12 Carefully replace the Top Cover. Turn the Adjustment Dial to the right 3 clicks. Adjustment Dial back to the left 1 click. Slide the Adjustment Dial Cover to the right. 13 Adjust the Adjustment Dial to 5. Roller Gap” on p. 29.
too much may damage the scanner.